Pakistani Taliban militants in police uniform attacked the Central Jail in Dera Ismail Khan late on Monday and managed to free around 247 inmates, as more than 25 explosions were heard and at least 11 people were killed and nine others wounded. 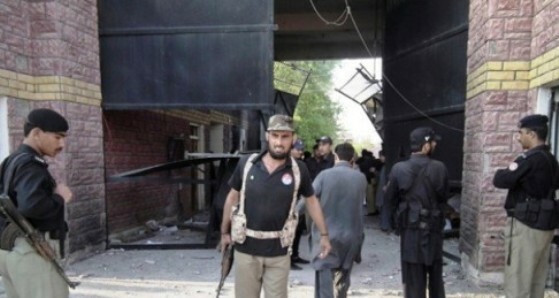 The attack in DI Khan is the second major incident of its sort – the first occurred at “Banno Jail”- and in both incidents, terrorists managed to achieve their proclaimed objectives. It incident places a question mark on the security arrangements of the jails holding terrorists/high profile criminals. Such acts transmit a negative message about the ability of Pakistani security forces. Pakistan ought to immediately execute a new robust security plan to avoid such incidents in the future. A judicial inquiry of the event should also be held and those responsible of this act of criminal negligence must be held liable. The possibility of internal involvement should also not be ruled out at this stage. The Afghan Foreign Ministry says the country’s president will soon visit neighboring Pakistan in an effort to mend fences, and says it hopes that the new government in Islamabad will seek to improve tense relations. The Afghan President’s upcoming visit to Pakistan is a positive scheme in easing the characteristically tense Pakistan-Afghanistan relations. Recently there has been increased strain on Af-Pak relations as the Afghan President has oft accused Pakistan of backing the Taliban attacks in Afghanistan. Both these neighboring states have been hard victims of terrorism and violent extremism and both must work together to combat this common enemy of regional peace and security. The visit provides an opportunity to both sides to re-establish cordial bilateral relations and to mutually reassure against the use of one territory against the other. Saudi billionaire Prince Alwaleed bin Talal warned in a letter to Saudi Oil Minister Ali al-Naimi and others that the U.S. boom of shale oil and gas will reduce its thirst for Saudi crude oil. “Our country is facing a threat with the continuation of its near-complete reliance on oil, especially as 92 percent of the budget for this year depends on oil,” he wrote. “It is necessary to diversify sources of revenue, establish a clear vision for that and start implementing it immediately. Prince Alwaleed’s approach is insightful in so far as the observation that the Kingdom of Saudi Arabia must work to diversify its sources of revenue. The United States is focusing on higher domestic production of energy resources from other technologies. Their aim is to reduce energy dependency on oil-rich countries including Saudi Arabia. If America manages to successfully de-hyphenate itself on a large scale from imported energy resources and relies on primarily on national production and outputs, this will result in significant cuts in oil-rich countries’ oil revenue. The price of oil may also decline in such a situation, as other industrialized countries are likely to follow the same path. Right now is the right time for oil-rich countries to take preemptive action against such a situation and to work on diversifying their sources of revenue. GCC states must reevaluate their oil import strategy and mange it according to these changing scenarios. They must also get rid of the “Dutch Disease”, that is, “the apparent relationship between the increase in exploitation of natural resources and a decline in the manufacturing sector”.